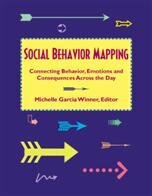 The Social Behavior Map (SBM) developed at the Michelle G. Winner's Center for Social Thinking is a cognitive behavior strategy used to teach individuals about the specific relationship between behaviors, other's perspective, other's actions (consequences), and the student's own emotions about those around him or her. The SBM is a visual tool that displays these abstract concepts through a flow chart. Collection of over 50 Social Behavior Maps covers a range of topics for home, community and the classroom. Edited by Michelle Garcia Winner.